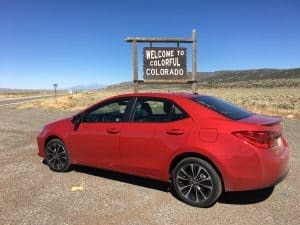 I jumped in the shiny new 2017 Corolla Special Edition (designed just for this anniversary!) Super fun and efficient, this car was a breeze to drive down to Santa Fe, on to Albuquerque and back to Denver with a few points in between. All told, I logged about 950 miles in the Corolla so I had plenty of time to figure out what made this a Special Edition. Toyota's Safety Sense P – pre- collision system, pedestrian detection, lane departure – kept me safe!! Oh the color: Barcelona Red Mettalic – loved it! This car was tricked out with the SE Premium Package (approx. 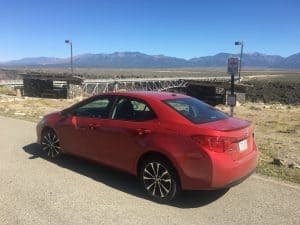 $1500 extra) which had the Entune Audio Plus, lots of fun tech extras, Moonroof with Sunshade (a big yes on a roadtrip in the sunny southwest) 6 bumping speakers and more. Total MSRP $23,069 – not bad! 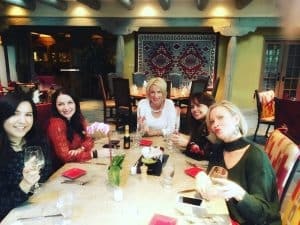 In addition to the fun of a solo road trip, the Allison PR and Toyota teams pulled together a great group of travel, style and lifestyle bloggers who also took their own road trip from points all around the SouthWest such as Austin, Phoenix (and several others from Denver as well!) The life of a blogger can be solitary at times so it was nice to have a 2 day stint to swap road & blog stories! 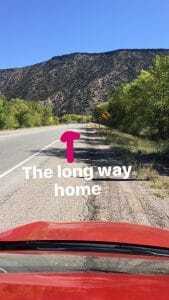 I've driven the stretch from Denver down to New Mexico about 4 times in the past year on my way to different locations (Austin, Great Sand Dunes, Phoenix, Austin again) and it just doesn't get old! It's definitely the road to the gateway to the South. And it always reminds me of the old Road Runner cartoons. What a treat to visit during the autumn season – Mother Nature sprinkles in some lovely color notes which pop in the desert atmosphere. Santa Fe is an art art and more art town. I didn't get to discover as much as I like since we were go go go. My home away from home for two days while in New Mexico was the Hotel Santa Fe – what an interesting little spot located on a very busy corner. Totally idyllic even with the busy traffic. Check out my review here. Tip: Santa Fe is at one badassery high altitude! Average is 7,198′ above sea level. One thing I recommend for high altitude travelers is Chlorophyll (insert the “please consult your doctor before taking any supplements” standard line here) – this helps with red blood cells and delivering oxygen to cells and tissues. And oxygen is scarce up there! So hey, if oxygen is scarce… why not go even HIGHER?! 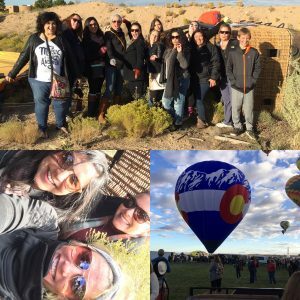 The highlight of the trip was an EARLY am jaunt from Santa Fe to Albuquerque for a balloon ride at the Albuquerque Balloon Fest. Ermagerd. Talk about bucket list. Just so you know, this kinda venture is not for the faint of heart with regards to planning. You get there early. You wait. You eat weird food at 5:30am and look for coffee (so much yes for a mini Dunkin Donuts booth!) It's amazing to see the line of cars roll in at 4:30 am. The “midway” is brightly lit and people are milling about. The balloons launched in the early hours so people start lining up to get seats to watch them. It was “Special Shape” Day which means mainly cartoon character balloons – what a treat to see them! The cool thing about the ABF is that they allow people to walk amongst the balloons themselves. Amaaazing experience! Oh, I should mention, Captain Craig, our Balloon pilot prepared us in the event of a bumpy landing. And it happened. And we were fine. And we all giggled as we picked dirt and weeds from our hair. The trip finished off with a lovely celebratory dinner back in Santa Fe at the amazing Restaurant Martin. 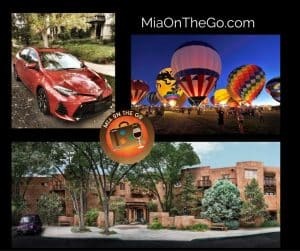 If you are in Santa Fe or near there, you MUST visit! A beautiful restaurant in a lovely setting – sustainable, green practices, amazing food – it has it all! We had a lovely time celebrating Toyota and enjoying the fabulous food. Everything is seasonal and locally sourced and we all gathered in their fabulous meeting space – what a great spot to share our Corolla and Southwest experiences. 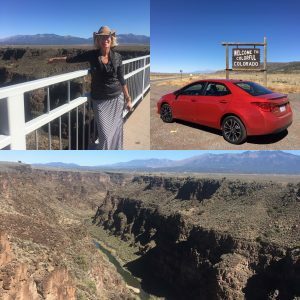 Again, kudos to Allison & Partners and Toyota for bringing together an incredibly diverse group of adventurers to celebrate the Corolla! On the way back home, Google Maps kept urging me to take the shorter route home. In retrospect, I probably should have because I sat in traffic for 2 hours as I approached Denver. But hey, at least I was in a comfortable car with amazing sound system! I took a lovely detour through the desert and ended up at the Royal Gorge Bridge. This thing is amazeballs. It's like this bizarre chasm in the middle of nowhere and you really don't see it until you are almost up on it. The bridge itself in unremarkable but the fact that it spans such a crazy gorge makes your mind tweak a little. As always, I was excited to go on the trip and, once completed, I was greatful to be home!